There’s been radio silence the past couple weeks because I’ve been spending my free time writing this WordPress-based eTextbook on Quantitative Literacy. There’s lots to be said about this, I suppose, but one of the things worth mentioning is what a pleasure it has been to author in this way. I’d love to tweak the template, maybe put in a “readability” style view, maybe an export to epub or PDF function. But having put it together this way, I’m not really sure what an eTextbook is anymore. Meaning, if we want focussed exposition we have ePub and PDF formats — as well as the dead tree format, which frankly has a lot going for it too. On the other hand, if we want interactivity, we have the web, along with tech like WordPress. There’s a space in-between those two, but that space feels to me like the space that was occupied by CD-ROM multimedia in the late 90s. And we know how that turned out — when people were in interactive mode, they really preferred the web. The late 90s saw some of the most beautifully designed multimedia education products we will ever see (Does anyone remember the Corbis stuff?) — but ultimately the web won out. Why do we think it will be different this time, exactly? I’m seriously asking. Is there a reason I am missing? As some of you know, I’ve been working the past three or four months on getting a MOOC on Quantitative Reasoning up and running for Spring 2013. Jim and Tim and I are in discussions on how this might work at this point, and the current plan is that it functions as a F2F class, plus a web community with some ds106-style mods. Quantitative Reasoning is one of the core AAC&U outcomes, and it is difficult to teach. It tends to have the sort of problems that online courses have not addressed well in the past. So this will be a test to see if even a fraction of the energy generated by the ds106 model can be sustained in a skill-centric statistical reasoning class. In any case, as the semester winds down, I’m starting to get back to it. I have the first chapter of the six chapter open textbook for the course written — it’s up here on WordPress, which turns out to be everything you really need for an e-textbook. Be aware that I haven’t figured out how to gracefully get all the chapter to show at once yet — you have to click next on that page to see the last four sections of the chapter. Chapter Two is coming along. Writing is hard. 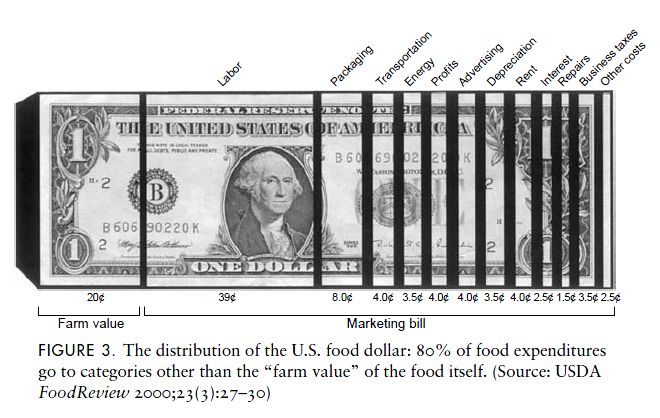 In other words, in 1993, more than 18 cents of every dollar you spent on food went to the farmer. By 2008, that amount was 15.8. And while those numbers seem small, it represents a 15% or so drop, which is no small change. For food you buy at the supermarket and prepare at home, there has been no shift in where the money goes to. 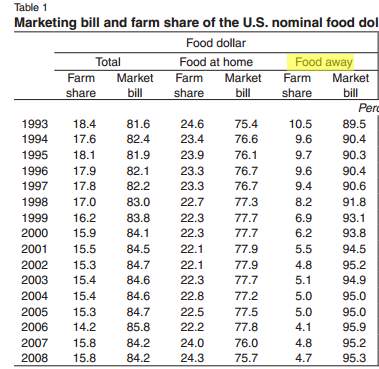 Food at home has a farm share of 24.6 in 1993, and a share of 24.3 today. Food prepared at restaurants and other “away from home” locations, though, has a sinking farm share, moving from 10.5 down to less than half of that (4.7). So what we are likely looking at here is an increase in the cost of eating out. The linked report sees much of this as being related to a shift from limited-service restaurants (McDonald’s, Papa Gino’s) to full service (Olive Garden, Outback, etc). Add to that the increasing cost of labor, and you get the sort of pattern we see above. Interesting graph, but undermined by its cuteness. Farm value and labor, the first two segments, make up just short of 60% of the total, but appear to be less than 50% (maybe even 40%) because of all the inserted black gaps. But maybe that’s by design, to make the relatively small advertising and transport costs seem bigger? This is a really sad chart: the incidence of SIDS (“crib death”) in Norway plotted out against the rise and fall of parents that put their children to sleep on their stomach. (Which was what they told you to do for a long time). The distribution of the information that prone (facedown) sleeping was a serious risk factor had a dramatic effect. In Norway, this information was spread by the mass media in January 1990. The SIDS rate in Norway dropped from 2.0 per 1000 in 1988 to 1.1 in 1990. In a retrospective study, it appeared that the prone (face-down) sleeping position after having continuously increased from 7.4% in 1970, was reduced from 49.1% in 1989 to 26.8% in 1990 (Irgens et al., 1995) (Figure 21).The example again illustrates how important it is to provide scientifically convincing evidence, pivotal to bring results of epidemiological research into practice. The SIDS experience raises important questions with respect to the reliability of recommendations given to the public based on epidemiological studies. The prone sleeping position had been recommended by pediatricians since the 1960s to avoid scoliosis as well as cranial malformations. Even though a case–control study in Britain early on in the period had observed an increased relative risk, no action was taken; again an example of the necessity to convince scientifically. There is a great post over on Kaiser Fung’s blog on the BMI/DXA debate. I suggest you go read it. What it is about is this — there’s a claim to be made that BMI doesn’t measure fat accurately, and a number of people are saying BMI should be replaced by this other measure (DXA) which measures fat accurately. But why do we care about fat to begin with? Well, it turns out we care about it because high BMI is associated with all sorts of negative outcomes. We have decades of decent research showing this. BMI is the predictor here, not fat. And it’s true that there are probably some ways to increase BMI that don’t decrease health, or decrease BMI in ways that puts your health at risk. If you’re a person that’s figured out a way to cheat the BMI metric, through starvation dieting or the like, if you managed to get down your BMI by letting your muscles deteriorate, then maybe DXA will keep you honest. Or maybe you should just alter your method of achieving lower BMI. Outside of personal decision — once we look at this from a population perspective — DXA makes even less sense. If the BMI association holds across the population as a whole, and the association is strong, then that is what you want to target from a public policy perspective*. The edge cases are already accounted for in that calculation. There are people that smoke all their life and don’t get cancer for genetic and environmental reasons we do not yet comprehend, but reducing smoking in the population as a whole has saved hundreds of thousands of lives. Do we need a better predictor than smoking — or do we just need to reduce smoking? There are cases, of course, where changes in metrics have made sense. 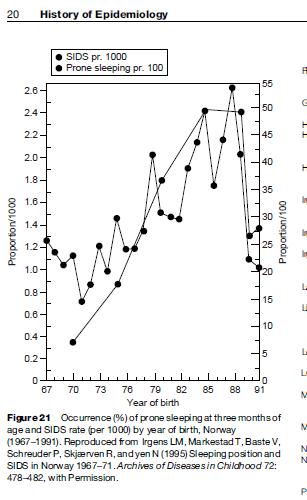 Cholesterol measurements now look at the ratio of LDL to HDL. But the reason they do that is not because “that’s what cholesterol really is”. The reason they do that is because the ratio has a been demonstrated as having a much stronger relationship to heart health than LDL alone or some other metric. That’s a pretty damning plot that has withstood decades of research. It’s a robust finding in a world of fads. In the DXA corner we have nothing. We don’t know that it predicts mortality one iota better than BMI. In 10 or 20 years, if DXA can significantly improve on that prediction, stand the test of time, and come out on top, then it might be worth a look. Until then, it’s just silliness. * There’s actually a pretty decent argument being made right now that BMI is not as manipulable a risk as something like smoking, and that the focus should be on long term interventions that stick, like those for cardiovascular fitness, instead of those that tend not to stick, like weight loss. And it can be argued that CVF predicts mortality even better than obesity. I’m interested in all of this — but it doesn’t change the fact the measure you need to make these arguments with is probably BMI. The center would tell you only that the average unemployment for college grads is about 9%. But the lowest rates here (5% for Education and Health) are significantly below that, and in fact significantly outperform the general unemployment rate. On the other hand, those getting a degree in Arts have an unemployment rate of 11%. Digging into the original report, I find the unemployment rate for recent English majors is 9.1%, about average. Of course, compared to those who didn’t graduate college at all, college grads do pretty well — even Arts majors. The overall recent college graduate average of 9% compares with a stunning 22.9% for people with only a high school diploma. There’s a mix of cause and confounding there, but even controlling for the usual suspects significant gains still persist.